Vegetarian Shoes started in 1990, with one member of staff who made all the shoes by hand. Back then, there was only one style of lace-up shoe available. Inspired by the recycling of car tyres into shoes in some parts of Africa, and a strong belief in the benefits of vegetarianism, Vegetarian Shoes was born. Now with a huge range of styles available, they mail-order their leather-free shoes to veggies all over the country! 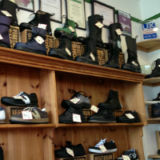 Check out their North Laine shop for a spot of guilt-free shoe shopping.